The United Nations human rights council is to investigate alleged human rights abuses by Myanmar’s army against the country’s Rohingya Muslim minority. 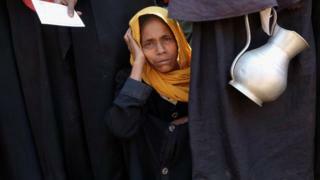 A Burmese official said the move was “not acceptable” as Myanmar was carrying out its own investigation. China and India did not back the decision, however. The two countries said they would “disassociate” themselves from the UN probe, Reuters reported. The resolution, which was brought by the EU and adopted by consensus, decides “to dispatch urgently an independent international fact-finding mission”, with a view to “ensuring full accountability for perpetrators and justice for victims”. Last month, the UN published a a damning report compiled after interviews with more than 200 Rohingya refugees who fled from Myanmar to Bangladesh. Nearly half of those interviewed by the UN said a family member had been killed. Of 101 women interviewed, 52 said they had been raped or experienced sexual violence from the security forces. The country’s government and its de facto leader Aung San Suu Kyi had previously dismissed claims of rights abuses and insisted that the security forces follow the rule of law. But her spokesman told the BBC that the latest allegations were extremely serious and officials would look into them.